Vinegar was discovered around 5,000 BC, when an unattended glass of grape juice turned, first into wine, then into vinegar. It was initially used as a way to preserve food, but its medicinal uses were soon uncovered. It is believed that Hippocrates used vinegar to manage wounds, while in the 1700s, medical practitioners used vinegar to treat everything from croup to poison ivy to stomach ailments. It has even be used to treat diabetes. Vinegar is made from any carbohydrate that can be fermented, including apples. Many people now know of the many uses and benefits of apple cider vinegar (ACV), which is why it has turned into a staple in so many kitchen pantries. Despite the recent increase in popularity, the benefits and uses of apple cider vinegar have been well-known for ages. While you may only be familiar with ACV’s uses in cooking, it has a whole host of other applications that include cleaning, washing hair, improving skin function, pest control, fertilizer and so much more. 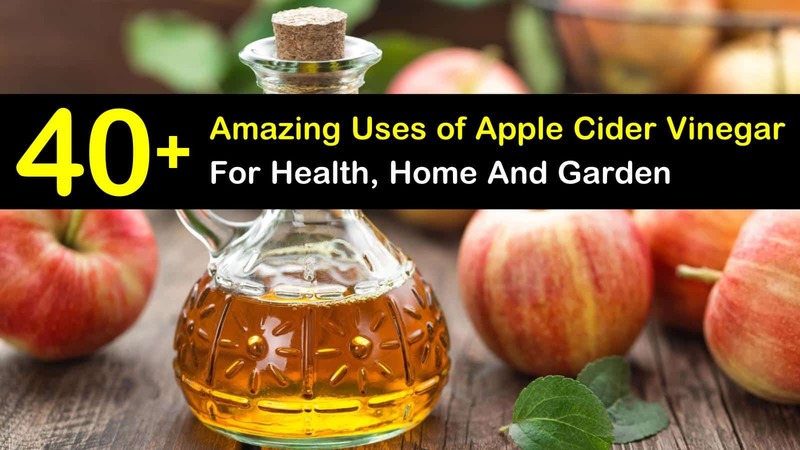 If you’ve never thought of using apple cider vinegar for anything other than cooking, here are some fantastic uses of ACV for your health, home, and garden. Apple cider vinegar is a result of apple cider going through the fermentation process to form health-promoting enzymes and probiotics. This process gives it fewer calories and significantly less sugar than apple juice or apple cider. It only requires one to two tablespoons of Bragg apple cider vinegar to take advantage of the health benefits with each tablespoon containing minimal sugar and only three to five calories. Here are some of the best uses of apple cider vinegar for your health. One of the most well-studies applications for apple cider vinegar is to help maintain healthy blood sugar levels. Try diluting two tablespoons of apple cider vinegar in a cup of water and drink it before your meals to help keep your blood sugar levels steady. One small study found that consuming vinegar can decrease blood sugar levels by an average of 31 percent after consuming white bread. Another benefit that you can gain with regular vinegar consumption is that it can increase insulin sensitivity. Insulin is a hormone that is responsible for transporting sugar from the blood to the tissues to be used as fuel. When you sustain high insulin levels in your blood, it can result in insulin resistance which means that its effectiveness is reduced and can lead to type 2 diabetes and high blood glucose levels. Taking just two tablespoons of ACV daily will help to increase insulin sensitivity. Cholesterol is a fatty material that accumulates in the arteries and causes them to harden and narrow. Having high blood cholesterol puts a significant strain on your heart, which forces it to work much harder to move blood throughout the body. Taking just two tablespoons of apple cider vinegar can help to lower triglyceride levels and promote heart health. A study out of Iran showed that providing rats with moderate amounts of apple cider vinegar helped to reduce the bad LDL cholesterol while increasing the good HDL cholesterol at the same time. Along with being beneficial for your internal health, apple cider vinegar is an effective treatment for acne and as a way to reduce scarring. Certain strains of bacteria contribute to the development of acne. Vinegar, which is well-known for its antibacterial properties has been proven to be effective in fighting many different strains of harmful bacteria. The growth of Propionibacterium acnes, the specific bacterial strain that is responsible for acne, is inhibited by the acetic acid, succinic acid, lactic acid, and citric acid components of ACV. These beneficial components might also work to reduce scarring caused by acne. To help improve the health of your skin, try this easy to make skin toner using apple cider vinegar. In a spray bottle or small glass bottle, combine all ingredients. Replace the lid and shake to blend. Store the toner in the fridge. Dab the toner on your face with a cotton ball. In recent years, ACV has been in the spotlight with natural health experts and fitness gurus as a way to quickly shed unwanted pounds. Research confirms that apple cider vinegar aids in weight loss. A study reported in the Harvard Health Blog revealed that acetic acid prevented fat deposition and improved the metabolism in obese rats and mice. Another study showed that by consuming two tablespoons of apple cider vinegar a day, over 12 weeks, resulted in the loss of nearly four pounds. Consuming ACV also increases satiety, which can help you reduce your overall intake and ramp up weight loss. Drinking apple cider vinegar daily decreases total caloric intake by up to 275 calories a day. Dilute the ACV with water as drinking it straight can damage tooth enamel. A significant risk factor for heart disease is high blood pressure. When your blood pressure is high, it forces the heart to work much harder and will eventually weaken the heart muscle and cause further deterioration. The acetic acid of ACV reduces blood pressure and significantly improves heart health. For the best results, dilute one tablespoon of ACV with eight ounces of water and consume the mixture three times a day. You can add a healthy shot of beneficial bacteria to your diet by opting for organic raw apple cider vinegar. The bacteria from ACV enhances the health of your digestive system and equips you with a host of added gut bacteria benefits like an improved ability to digest and absorb food, as well as increased immunity. Add one to two tablespoons of ACV to your diet every day to boost the health of your gut. Apple cider vinegar is a great all-natural remedy to soothe sunburned skin. If you’ve spent a bit too much time soaking up the rays, you can get some relief with apple cider vinegar. Add a cup of ACV, ¼ cup of coconut oil, and some lavender essential oil to a lukewarm bath and soak for at least 20 minutes. Many home remedies for foot fungus use apple cider vinegar. Common fungal infections like toenail fungus and athlete’s foot, yeast infections and jock itch, can be treated with apple cider vinegar. A homemade antifungal spray is one of the most effective uses for apple cider vinegar. Along with other fungus-fighting ingredients, this home remedy reduces symptoms and provides quick relief. In a five ounce or larger glass spray bottle, combine ingredients. Replace the top and shake well to ensure the ingredients are blended — store in the refrigerator to provide a cooling and soothing sensation when used. Using apple cider vinegar on varicose veins helps to reduce the symptoms associated with the condition, according to recent studies. Try combining apple cider vinegar with witch hazel and scrubbing your skin in a circular motion to improve circulation and ease symptoms. Many people have a low level of stomach acid, which results in acid reflux. Apple cider vinegar increases stomach acid levels to prevent backflow of acid into the esophagus, which significantly enhances your risk of esophageal cancer. This home remedy works best if you drink a tablespoon of ACV diluted in a cup of water right before you eat. If you have a wart, soak a cotton pad with apple cider vinegar and apply it directly to the wart. Cover it with a Band-Aid overnight. Repeating this for several weeks causes the wart to fall off eventually. While the process may take a while, it’s a much better option than getting it frozen. Apple cider vinegar soothes a poison ivy rash. ACV contains potassium, which reduces inflammation and swelling that is often associated with a poison ivy rash. Apply one teaspoon directly to the skin a couple of times a day until the rash is gone. Many people look to apple cider vinegar as a natural remedy to deal with their seasonal allergies. Apple cider vinegar’s healthy bacteria can promote a robust immune system and supports healthy lymphatic drainage to get rid of seasonal allergies. The next time your allergies are acting up, try drinking two tablespoons of ACV diluted in water. Apple cider vinegar is well-known for its amazing antibacterial properties, which means that it eliminates terrible smells. Mix some ACV with water to make a deodorizing spray to neutralize unwanted odors. You can also combine the apple cider vinegar with water and Epsom salts to create a homemade foot soak that can kill odor-causing bacteria to help you get rid of foot odor. If you have dry or dull hair, apple cider vinegar may be the answer you’re looking for to fix the problem. You can make an ACV rinse that will work to prevent dryness while making your hair smell great and keeping it lustrous and shiny. Combine the apple cider vinegar to the glass bottle, then add the water. Replace the cap and shake well. Next, combine the essential oils in the glass bottle, and mix again until the ingredients are well blended. After shampooing, apply the rinse to your hair and scalp and rinse with cold water. The primary component of apple cider vinegar is acetic acid, which is acidic; it has an alkalizing effect on the body. Adding apple cider vinegar to your daily diet can help to keep the pH levels in your body balanced and help to promote optimal health. Apple cider vinegar naturally helps to whiten teeth and brighten your smile. For the best results, trying using a bit of ACV to brush your teeth and then thoroughly rinse your mouth. Overdoing it can erode the enamel, which won’t grow back. Make sure that you use a moderate amount. When you start to feel a cold coming on, taking a few tablespoons of apple cider vinegar can be a useful natural cold remedy to help relieve your symptoms quickly. ACV contains beneficial bacteria that will provide your immune system with a quick boost, especially if you’re feeling a bit under the weather. ACV has been proven to help balance your pH, enhance circulation, and encourage lymphatic drainage, which makes it a great tool to detoxify your body. The usual dosage of apple cider vinegar is one to two tablespoons mixed with water taken several times a day. However, you can also make a detox drink to supply your body with a strong megadose of healthy ingredients that can help in detoxification. Make sure the water is warm. Add ingredients to the water and stir until combined. Drink the entire glass. The drink is best served warm, but drink it at the temperature that you desire to help detox the body and rejuvenate it. Apple cider vinegar is one of the home remedies for skin tags, the noncancerous skin growths that form on your skin that are very common. The acetic acid in apple cider vinegar breaks down the tissue surrounding skin tags and eventually causes them to fall off. Soak a cotton ball with vinegar and place it on the skin tag, securing it with a bandage. After 15 minutes, you can remove the cotton ball and thoroughly wash the area with warm soapy water. Repeat the process daily for two weeks. Apple cider vinegar is a popular home remedy for soothing a sore throat. The antibacterial properties of ACV help to kill off the bacteria causing the issue. To use apple cider vinegar to soothe a sore throat, dilute two tablespoons with eight ounces of water and rinse a couple of times a day until the sore throat is gone. Apple cider vinegar is extremely acidic and has been known to cause burns to the throat if taken undiluted, so make sure you are mixing it with enough water. The acidic nature of apple cider vinegar cleans and deodorizes your home, making it a great alternative to the chemical cleaners that you use to clean your house. It can even be used in your laundry, to take dirt and grime off your outdoor furniture, and can also be used to kill bugs and fleas. Here are the top uses and benefits of apple cider vinegar for around the home. Just like with other types of vinegar, apple cider vinegar is an extremely effective preservative. Vinegar has been used as a pickling agent to preserve foods for centuries. Apple cider vinegar works by making the food more acidic, which then deactivates its enzymes and kills the bacteria that cause food spoilage. One easy way to utilize apple cider vinegar in your home is to make a simple salad vinaigrette. Here’s a recipe that will become a staple in your kitchen. A homemade salad dressing that uses apple cider vinegar is much healthier than the ones you can purchase at the store, and they are often much tastier. In a small bowl, combine the ingredients by stirring well. Pour over your salad and enjoy. Apple cider vinegar is a popular natural alternative to commercial cleaning products because of its antibacterial properties. Making a DIY all-purpose cleaner with vinegar or ACV is one of the most powerful natural cleaning solutions available to you. Mix one cup of water and a half a cup of apple cider vinegar in a spray bottle. Use to wipe down counters and other hard surfaces to eliminate harmful bacteria. When you are boiling or poaching eggs, add vinegar to the water to produce better eggs more consistently. When you expose eggs to an acidic liquid, the protein in the egg whites will firm up more quickly. When you use vinegar to boil your eggs, it can also help to speed up the coagulation of the egg whites, which is useful if the shell cracks while you are cooking the egg. Many people wash fruits and vegetables in apple cider vinegar to remove chemical residues left over from the pesticides used when growing the food. Washing your fruits and vegetables in vinegar eliminates harmful bacteria like Salmonella and E. coli. If your four-legged friend can’t stop scratching, use apple cider vinegar as an alternative to the chemical-laden flea killers on the market today. Make your own natural flea killer simply by mixing one cup apple cider vinegar and one cup water and pour it into a spray bottle. Apply the mixture to the fur of your dogs or cats once a day until the fleas are gone. Most bug sprays that you buy in the store contain DEET, which can be extremely harmful to your health. Apple cider vinegar is an all-natural alternative that gets rid of the risk of side effects associated with hazardous chemicals. You can make a simple homemade bug spray with ACV that is quick and inexpensive. Put all ingredients in the spray bottle and shake to combine. Spray over your body to deter bugs. Avoid spraying near your eyes or in your mouth. Another great way to use apple cider vinegar in the kitchen is by making a delicious marinade. Apple cider vinegar is a favorite ingredient in many steak marinades at the store because it instills the meat with a nice sweet and sour taste. Combine some ACV with wine, soy sauce, garlic, cayenne pepper, and onion to give your steak a delicious flavor. Use apple cider vinegar in your laundry to help deodorize and aid in cleaning. Before adding clothes to the washing machine, add ½ cup of apple cider vinegar to the water in the tub when doing a regular sized load of laundry. Add a cup of vinegar to an empty washer to clean the washing machine itself. While we’ve shown you a ton of ways to use apple cider vinegar in your home and to help improve your health, did you know that you can also use ACV in the garden? That’s right; you can use ACV in your garden to fertilize your plants, kill weeds, and get rid of bugs. Here are a few ways that you can use apple cider vinegar in your garden. White distilled vinegar is often used as a herbicide in the garden, but apple cider vinegar fertilizes your plants. To use as a fertilizer, add 10 ounces of unfiltered organic apple cider vinegar to ten gallons of water. Pour the mixture over the soil near the roots of your plants or you can use a watering can or sprayer on each plant that you want to fertilize. Use apple cider vinegar to protect your fruits and fruit trees, and prevent annoying fruit flies from entering your home. You can make a homemade fruit fly or gnat trap to capture the annoying pests before they have the chance to reproduce. In a large container, mix the apple cider vinegar, sugar, water, and molasses. Pour the mixture into the cans, then hang them from your fruit trees. The combination will attract the fruit flies because they love to eat fermenting fruit that is replicated in this recipe. Make sure that you place the traps at the level where the fruit develops to be the most effective. If your garden tools are exposed to damp conditions, you’ll end up with rust. The good news is that you can use apple cider vinegar to get rid of the rust and bring your tools back to their former glory. Pour some apple cider vinegar in a spray bottle and spray your tools. If the rust is particularly bad, soak tools in a bucket of apple cider vinegar for a day. Remove the tools and wipe off the rust. Make sure to rinse the tools and thoroughly dry them. Some of the more common animals that like to get in your garden, like rabbits, raccoons, rodents, moles, and deer, hate the smell of vinegar. Placing a few rags soaked in ACV in the garden will help keep out these animals and will naturally prevent them from destroying your plants. To ensure their continued effectiveness, re-soak the rags once a week. Japanese beetles are insects that can do tremendous damage to plants. Luckily, apple cider vinegar will get rid of them. Combine one part apple cider vinegar, three parts water, and one teaspoon dish soap. Pour in a spray bottle and spritz your garden plants to get rid of Japanese beetles. You can take care of slugs and snails in your garden with apple cider vinegar, but it will take a bit more work on your part since they prefer to move around at night when it is colder outside. Trick them into gathering during the day with a board and a stick. Prop the board up in your garden using the stick to create some shelter from the sun. Once the snails and slugs congregate under the board, spray them with apple cider vinegar to dissolve them. ACV also works as a wonderful natural slug repellent. Don’t spray anything in your yard or lawn that you don’t want to kill because undiluted apple cider vinegar will burn your plants in the sun. Clay pots are great to have in your garden because they keep the soil cool during the heat and allow the plants to breathe. However, they also absorb calcium and other minerals from the water, which can discolor them. Fortunately, you can use apple cider vinegar to clean them, rather than purchasing new ones. Scrub loose dirt and then soak in a solution of four cups water and one cup vinegar. Let it sit for 20 minutes. Remove from the vinegar and soak in clean water. Some plants prefer to live in more acidic soil. Apple cider vinegar naturally adjusts your soil’s pH level without resorting to expensive and harsh commercial products. Test the soil to determine its precise pH before you use the apple cider vinegar. If your ground needs additional acidity, mix a cup of ACV with a gallon of water, and then pour it over the soil. Apple cider vinegar is also a great natural, homemade weed killer. If you have any unwanted weeds in your garden, spray them with undiluted vinegar to get rid of them. To make it even more useful, mix the ACV with soap and lemon juice and pour the solution directly over the weeds. Apple cider vinegar is a fantastic product that has a variety of different uses. It is extremely beneficial for optimal health, can be used in a variety of ways in the house, and can even offer benefits in your garden. The number of uses for apple cider vinegar is staggering. 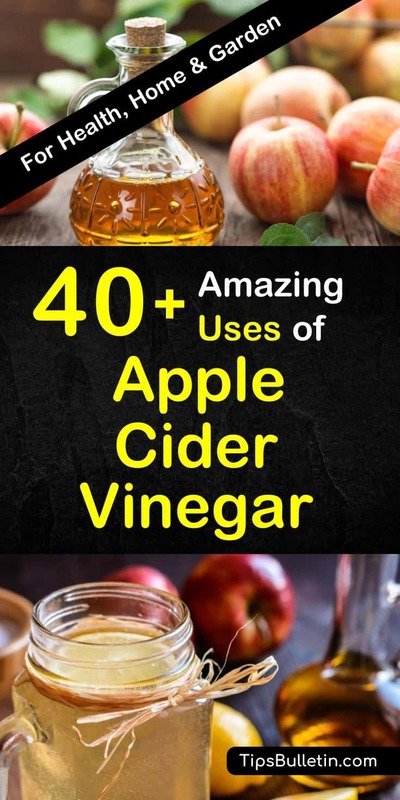 These 40 uses for apple cider vinegar will have you stocking up and turning to this wonder ingredient for all your house, garden, and health needs. We hope you enjoyed discovering the different ways that you can use apple cider vinegar. If you found the list of apple cider vinegar uses helpful, please share this comprehensive ACV uses and benefits list with your family and friends.